Author and professional speaker Dawn Shaw originally posted this thoughtful reflection on her personal blog, Facing Up To It. She understands adversity. She was born with a rare tumor, the removal of which left her face half-paralyzed. Here she talks about what she does in tough situations when others notice her differences...she turns them into opportunities! Recently, an article about facial discrimination that was published online was brought to my attention. 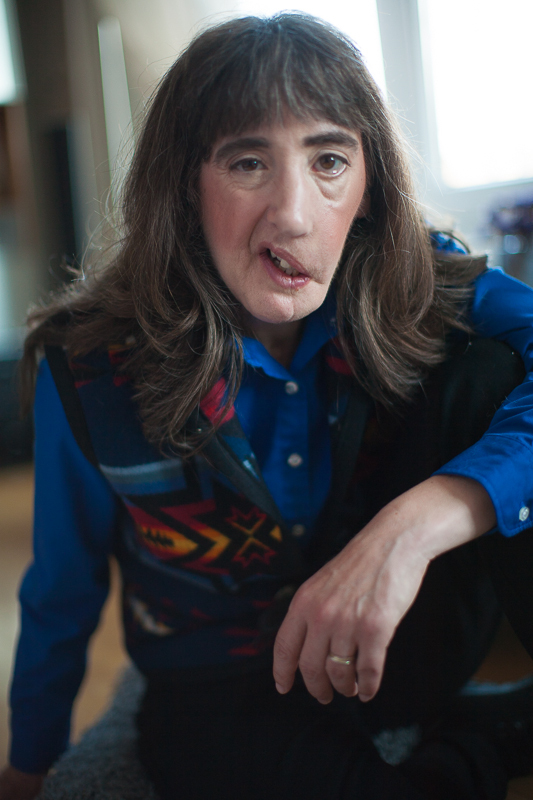 It is called Distorted Faces: Living with Facial Disfigurement (Click the title to link to the article.) While I object to the use of the term “disfigurement," I thought the article was well thought out, well written, and brought up a lot of very interesting…if painful…points. I especially appreciated that it explored the psychology around physical differences in our society. Thankfully, when I go out, I don’t see people recoiling in horror, doing double-takes, or demonstrating a startle reaction when they see me. Admittedly, after 48 years of having a different face, maybe I have developed a filter so I just don’t notice. However, I do a lot of very public things, like volunteer to sell merchandise for bands. Every once in awhile it occurs to me to look around and see if I can catch any sort of reaction when people see me. I seldom do. I give most people a lot of credit for internalizing their reactions. For the most part, people don’t remind me of my appearance. Sometimes I catch people staring at me, sometimes I don’t. Usually I will notice children because they are so overt about it. Often I just smile, wave, and if they are close enough say “hello” to them, which lets them know that I’ve noticed that they are watching me. Acknowledging them helps demonstrate that I am a person, not an object. In other situations, I will invite children to ask me about my face. I do this because I believe that it is important for them to acknowledge their curiosity and especially because it encourages the child to engage the person they are curious about directly. Often, children will ask the adult they are with “What happened to her face?” Except on very rare occasions, the adult they are with doesn’t know. Worse yet, the adult will make up an answer. I prefer to answer for myself, and am always thrilled when the supervisory adult supports and encourages my engagement. Most significantly, once the child’s curiosity is satisfied, I am no longer interesting to them and they go about their business. How do I react when I see other people with physical differences? Of course I notice. But I have learned to internalize my reaction. I try to treat others as I prefer to be treated. Yet I am still learning to squash my assumptions. Those, too, are strongly associated with being human. The article I mentioned earlier, while it addresses our human expectation regarding faces and an involuntary uneasiness when our attention is drawn to a face that defies the norm, it is not about “making it OK” to be afraid of someone who is different. However, those of us who are different have to allow people to be human. We, meaning people with physical differences, are going to get noticed. I have been known to use this to my advantage. However, as human beings, we should be allowed the expectation of being treated decently by other human beings: with respect. Curiosity is normal. Rude behavior is never OK.
Want to read more by Shaw? She has written three books — her memoir, “Facing Up to It,” and a guide to developing resilience called “Friending the Mirror, ” and “Facial Shift, Adjusting to an Altered Appearance” for people who suddenly find themselves with a changed face. She hosts a webinar series also called “Friending the Mirror,” which focuses on appearance-related issues. Dawn also raises Icelandic horses and has a passion for live music.